The Kohaku is the most highly cherished of the koi varieties; a good specimen will be very valuable and really stands out in the pond. 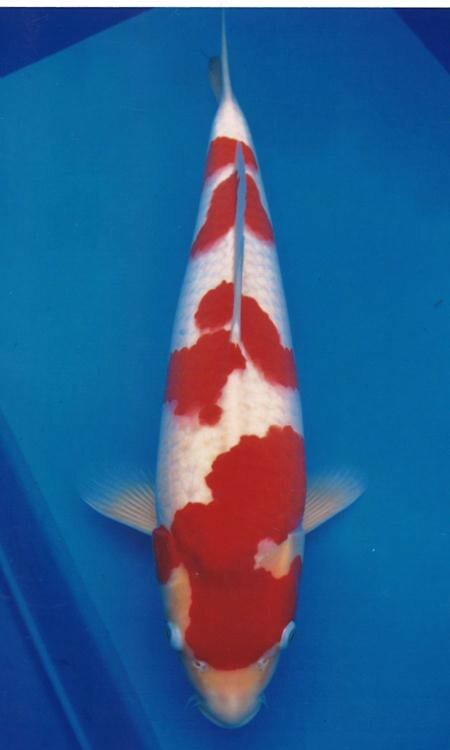 It is described as a two colour, non-metallic koi, namely a white bodied Koi with a red (Hi) pattern on its back. On a good specimen of Kohaku, the pattern should have clearly defined edges and the white should be a good unblemished colour, often described as snow white. The contrast between the two colours can be striking and this is why the Kohaku is so highly prized. Although a Kohaku cannot have colour variations, it does have pattern varieties and these are generally known by the number, or placement, of Hi patches along the length of the body. Maruten (one circular Hi patch on the head and other Hi on the body), Nidan (two Hi patches along the back) and Inazuma (a single Hi patch along the back in the shape of a lightning strike) are some examples. These are classic patterns, but other pattern formations are equally attractive, provided the pattern is well balanced. Normally, there should be no Hi on any of the fins of a Kohaku; they should be white at the body joint, changing to almost clear at the tips. The body volume of a Nidan Kohaku is superb. The two patches are almost linked by the extended Hi on the right side. The white nose and caudal regions set this fish off wonderfully. 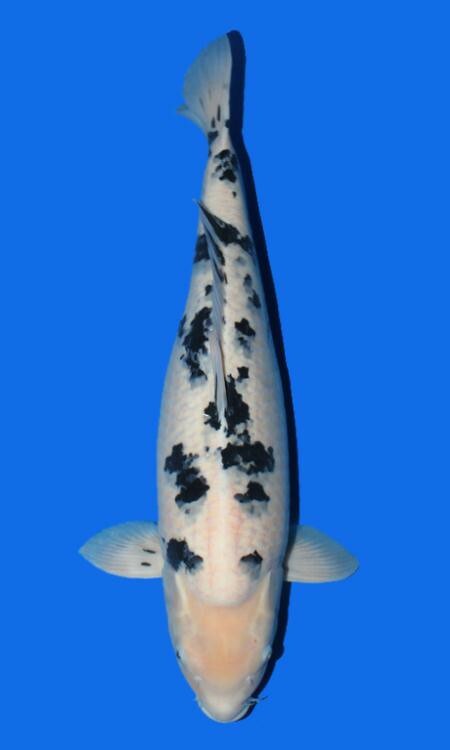 A beautiful Maruten Kohaku with a snow white skin and beautiful pectoral fins. Good body shape and the excellent pectoral fins make this a koi that will really stand out in your pond. The Bekko is described as a fish with a black pattern on a coloured base. The black (Sumi) appears as balanced patches along the back of the koi, above the lateral line but not on the head. As in the Utsuri, the Bekko occurs in the base colour variations Shiro (white) Bekko, Aka (red) Bekko and Ki (yellow) Bekko.